I really don’t get it… This image has been circulating around social networks for almost a year specially in Facebook. 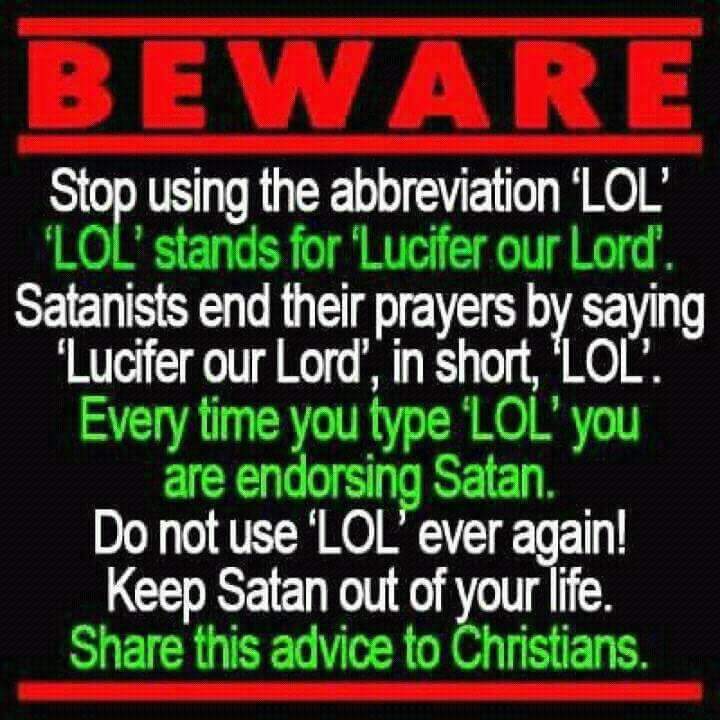 How did an unknown person came up with this absurd idea that “LOL” stands for “Lucifer Our Lord”? LOL! Point 1: The Latin word “Lucifer” is not the name of Satan. It is just a Latin translation of “morning star”, the planet Venus, which was usually associated with the kings of the ancient. The word “Lucifer” was found in the Latin Vulgate made by the medieval scribes to translate the Hebrew bible (Torah) into Latin. The translators of King James subsequently failed to translate this word into the English language. Point 2: Jesus was himself titled as the “morning star” and if we convert that to Latin, Jesus was also Lucifer if we will refer back to the original Latin Vulgate version of the Hebrew bible. Point 3: The Vatican itself does not call Satan as “Lucifer”… Just Satan, which is a Hebrew word for nemesis or enemy. Otherwise, the Vatican will have to deal with Point 2. Hahaha! Yup… Just to emphasize that anyone can put words on any acronym. Wink! Hahaha! Exactly… That’s my point! LOL!